Dividing this cake recipe in half, and baking two 6-inch (rather than 8-inch) layers, is a bit tricky because it involves small proportions as well as using 1 1/2 eggs. That said, I do have a preference for these mini cakes when it's just for my small family. We can polish it off quickly and keep the rotation of treats coming! Like me, my son prefers chocolate-flavored whipped cream to plain if there's a choice so I took about a half a cup of heavy cream and whipped it with a tablespoon of cocoa powder, about 1 1/2 tablespoons of confectioners' sugar, and a touch of vanilla extract. I whipped the cream by hand with a large whisk, making sure not to over-whip; if you do go overboard on the whipping, just gently whisk in another spoonful or so of cream until it comes back together in a smooth consistency. You can see why they call this cake a "sandwich" sometimes. 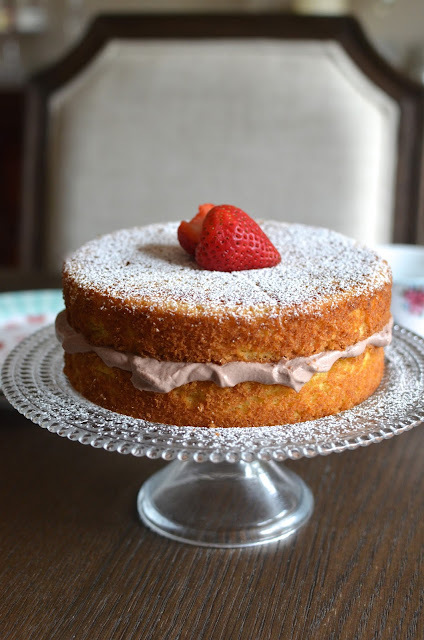 Go the more classic route by sandwiching the two cake layers with a smattering of strawberry jam and whipped cream. You can add some fresh sliced strawberries on top of the whipped cream as well. Be sure to use a serrated knife to gently saw into cake layers to get neat slices; the whipped cream filling has a tendency to ooze out. This was as pretty to look at as it was good to eat. Make it for your next tea party or for no particular reason other than to enjoy a good slice of cake. Preheat oven to 350 degrees. Grease and line the bottom of two 8-inch round cake pans with parchment paper. In the bowl of an electric mixer, beat butter and sugar together until light and fluffy, about 3 minutes. Beat eggs, one at a time, until incorporated, then beat in milk and vanilla, scraping down the bottom and sides of the bowl as needed. Mix in the flour mixture until just combined. Divide batter between the two prepared pans, smoothing out the tops. Bake cakes until golden brown and springy, and a cake tester inserted into the cakes comes out clean, about 25-30 minutes. Let cool in the pan for about 10 minutes, then unmold and transfer (flat side down) on to a wire rack to cool completely. To make cocoa whipped cream, beat heavy cream in the bowl of stand mixer fitted with the whisk attachment. Gradually add the confectioners' sugar and cocoa, followed by vanilla extract. Beat until it just reaches stiff peaks. Place one cake layer onto a serving plate. Spread whipped cream evenly over the top. Place the second cake layer on top of the cream. 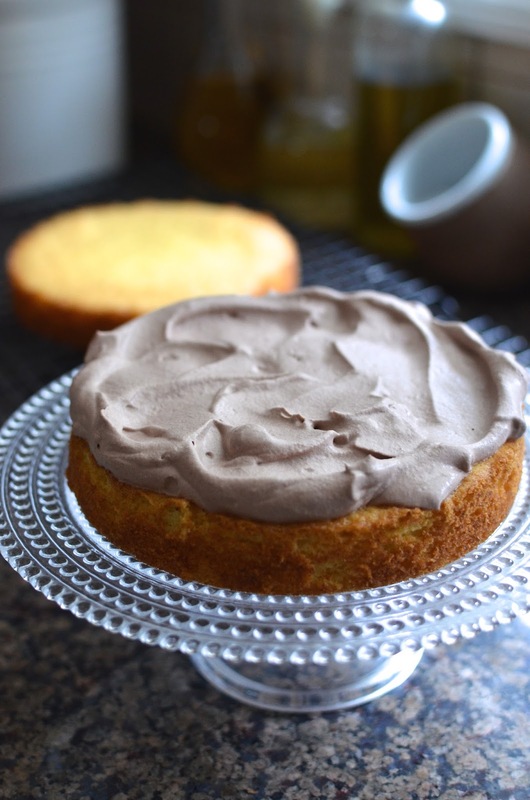 Dust cake with confectioners' sugar. 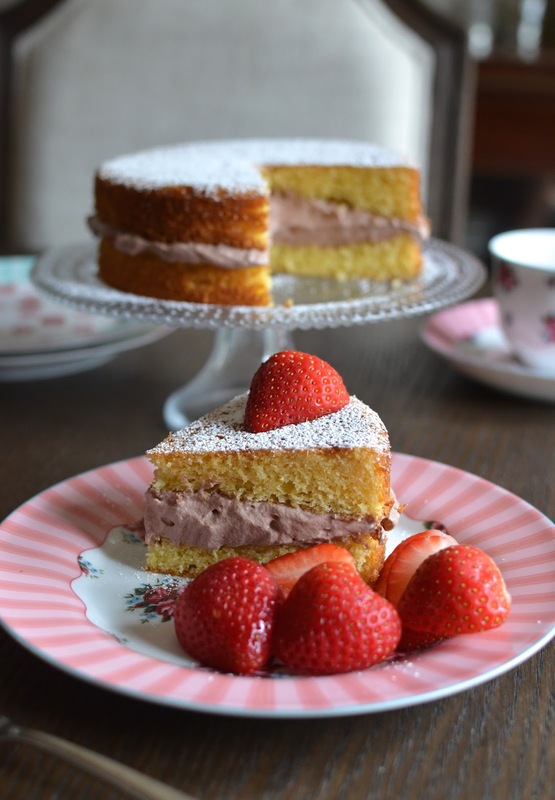 Slice cake with a serrated knife and serve with fresh strawberries on the side, if desired. This looks wonderful Monica and you're right - why not chocolate whipped cream?! Strawberries on the side seals the deal for me too. You make the most beautiful cakes! Hope you're enjoying the cooler weather. Happy hump day! I'm glad you're okay with me using the cocoa whipped cream, Tricia. ; ) It's been a nice week but rain is coming tomorrow. Can't complain though! It looks so beautiful and I love the fine smooth crumb of the cake. Thanks so much...glad you like that cocoa whipped cream. This kind of cake is too easy to eat, Ashley! Hi Monica, oh I love that New York times cooking section, they have such great recipes. This looks like a wonderful cake, love the chocolate cream in the middle and the strawberries on the side. Your cake looks so light and fluffy but I am sure it has way more flavor then the sponge cakes in Maxims. I could eat your filling by the spoon fills. Thanks, Bobbi. Hope you're having a great week! I love Victoria Sponge Cake since my years in the UK. The first time I ate it was in Brighton in the Bed&Breakfast where we stayed. And that day it rained in the afternoon, so we went back for a moment and enjoyed a glorious moment (there were more ladies of a certain age that young people like us) but I loved that ambiance - a whole ceremony - like in the books of Agatha Christie. Really. Sorry darling, your post brought back good memories. Okay, let's get back to your VSC - it is beautiful and we see that it is fluffy. If I was in your city I would invite myself to your place to have a slice or two.... Hahaha. P. S. Here we are enjoying our last days of holidays, called "Potatoes Holiday"
Don't apologize...I *loved* reading that! I can almost picture your B&B stay and I love it! Agatha Christie is my favorite author so I would have loved to soak up that ambiance, while eating cake! And now I have to figure out what "potatoes holiday" is!! Enjoy the rest of it and soak up every moment (I know you are...). Thanks for the great comment! What a classic, I love the colour of that filling! This cake looks gorgeous. The filling sounds so delicious! Thank you! It is a lovely classic. What a simple, but elegant cake! I have never had Victoria Sponge, but I definitely think your chocolate whipped cream is an upgrade! When I am halving a recipe and need half of an egg, I do it by weight. I put a bowl with the entire beaten egg on a kitchen scale and remove half for the recipe. Is that what you do? I can see why it's such a classic; it's so simple and just plain good. Thanks, Kelly. I need to make myself (and a few guests) a homestyle true afternoon tea one day. I love the general idea and ritual of tea and well...having a ton of food and pastries with it! Your cake looks gorgeous. I love afternoon tea and I can't wait to try this recipe. thanks for sharing! 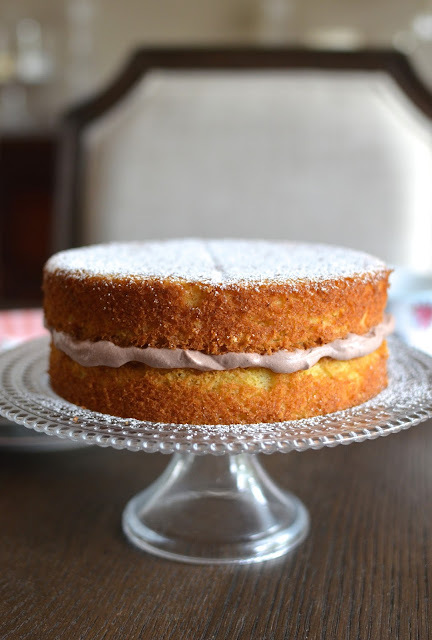 I just recently learned about Victoria sponge cake from the BBC show "The Great British Bake Off (American version is called The Great British Baking Show). Anyhow, the contestants always make Victoria sponge cake. I thought it sounds delicious and I have been wanting to try it. Your recipe comes at the perfect timing. Bookmarked! P.S. If you are not watching the show, you need to check it out. You would love it! I have watched a few seasons of it and the contestants always wow me! I do love British notions of tea and sponge cake and that ritual. This is a classic.